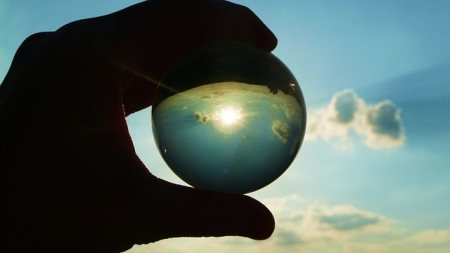 Kabbalists tell us, that by studying their wisdom we can change our perception and instead of this world we can start perceiving the spiritual reality. As stated above, they also reach us, it is desire that shapes our perception of reality. Now we will try to understand what parts make up the desire, why we were created specifically as we are, and how we can change our reality for the better. Along the way, we will discover why such emotions as hatred and love toward others appear in us, what causes us to be glad when someone else is suffering, and why we are envious when the neighbor buys a new car. Question: if the purpose of creation is to be delighted, why does it seem that matters are constantly getting worse? The Book of Zohar explains that in truth, we exist in a perfect system that was created by the Creator. The whole of the substance of creation is the will to receive, and the perfect system is actually the comprehensive will that was created. This will is also called “the general soul” or “the soul of Adam HaRishon.” However, the Creator broke the general soul into many pieces, and in each of us there is only a tiny fraction of the general soul. Prior to the breaking, we all felt like organs of a single body in this system. Everything was perfect and unbounded; hence, at that time, the system was called “the world of Ein Sof [infinity].” In the world of Ein Sof, all parts of the system are connected with love and are filled with light. However, the creator placed 125 “filters” on this system, which conceal the worlds so now we cannot sense that there is any light there. We are on the outermost layer and have no sense whatsoever of the previous layers, hence the connection between us is completely distorted. Instead of feeling the love that connects us in the world of Ein Sof, there is hatred and repulsion among us. We do not feel the comprehensive connection between us; instead, we are separated and detached. And Stage Three: the perfect state, which we must create by ourselves (returning to the world of Ein Sof). It is quite similar to the way we behave with children. We take a picture, cut it into pieces, then let them put the pieces back together. The reassembly process develops the child. As a result of the shattering, the will (known as Kli [vessel]) of every person was divided into two main parts: internal Kelim [vessels], known as “root,” “soul,” and “body,” and external Kelim, known as “clothing” and “palace.” I perceive my inner Kelim as “me,” therefore I care for them, and I perceive the external Kelim as alien, not my own. The inner Kelim and the outer Kelim contradict each other, so the more I love my inner Kelim, the more I hate my outer Kelim. There is a boundary between those two types of Kelim—the border of the shattering. It is a kind of partition that causes me to look outward only in a mindset of “What can I receive from there to improve my situation? What does that give me?” It compels me to always relate to others egoistically, desiring to exploit them. I always evaluate my situation by the difference between myself and the rest of the world. Hence, as surprising and as odd as it may sound, the worse it is for the world, the better it is for me—provided it does not put my personal safety in any danger. I cannot tolerate fulfillment in the external Kelim. I cannot remain indifferent toward another or behave as though I do not care about him or her. When another person succeeds, it is very painful to me, it really destroys me. I constantly compare. We cannot simply ignore those external Kelim because we feel them as belonging to us. If there were no connection between us, it would be another story. However, the shattering created a negative connection between us so that even if we did nothing bad to one another, the force of the shattering makes us de facto enemies. Understanding how these matters work is extremely important because it serves as a means for change, a lever for development. Human egoism feels that killing other people, exploiting them, and dominating them is pleasurable for it. This is the result of the shattering—man is hurting himself, his own external Kelim, but he doesn’t know it. When we find out that all the evil we have been trying to inflict on others was really inflicted on ourselves, will experience immense disillusionment and pain. Yet, it is precisely this pain and disillusionment that will help us carry out the actual correction. Hatred between inner and outer Kelim is a human phenomenon that doesn’t exist in the animal kingdom. When a lion eats a zebra, it doesn’t hate it, and the zebra doesn’t hate the lion. The lion regards the zebra as food and the zebra tries not to be eaten. But there is no hatred between them. Nature governs both of them perfectly. If there were no connections between us, we would not be able to discover the reason for what is bad in our lives. However, because we are discovering that the connections between us are bad, we can then turn them into good. Let us examine the current state of humanity. In the past, ties among countries barely existed. Each country was connected only to a few other countries. When we were far from each other, there was not much contact, hence the evil was not so evident. But as the world became more globalized, everyone became connected, affecting everyone else. Suddenly, there was nowhere to run. We do not have another earth, hence the hatred between us is surfacing. Yet, it is precisely this hatred that will compel us to correct our relationships. 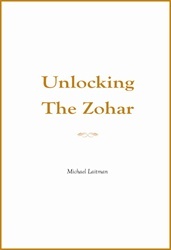 “What the Problems of Our Interconnected World Are Leading Us Towards” is based on the book, Unlocking the Zohar by Dr. Michael Laitman. Want to be Able to Feel the Creator? The Creator is fully the giver. He is the characteristic of bestowal and love. There is nothing more than this. There is only complete bestowal, complete love, absolute, pure, perfect, and infinite, and it is revealed in us to the same degree that we are ready to absorb it, to bring ourselves in line with it. In general, I can understand and feel every characteristic only if it is found within me. When I look at some cockroach, I don’t feel that it lacks something, that it loves its children and right now, is running to them with crumbs of food. I don’t share any characteristics with it to be able to feel it. However, if I would begin to go deeper to penetrate and explore, ultimately, I would feel the needs of the beastly level. People are able to be sensitive to animals they are close to, including pet owners or scientists who devote themselves to research. For example, in my childhood, I had a friend who always had small animals living in his pockets: here a mouse, there a bird. He even would come to school with them, and, much later, he went on to study zoology. So, he understood them. He would find a white mouse and pet it, and the mouse wouldn’t run away. He would say, “You know, he is not afraid to approach you,” as if he was whispering to it. 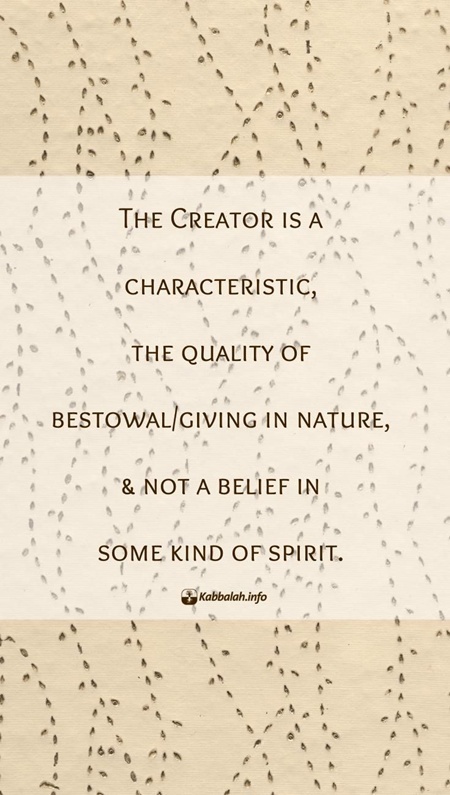 However, we need to develop other feelings within us to be able to feel the Creator. If my friend recreated the feelings of the mouse within himself, so we need to give shape within us to a feeling of the Creator, bestowal and love.